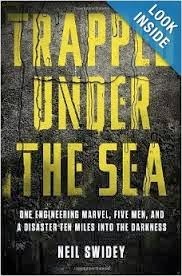 Trapped Under the Sea by Neil Swidey was a highly entertaining read that combined a disaster tale with a fascinating story of engineering feats and organizational dynamics, with this all told well through the lives of people who 15 years ago found themselves facing disaster at the end of a 9 1/2 mile tunnel below the sea in the Boston Harbor. From an organizational dynamics perspective, Swidey recounted the huge number of poor decisions that came as a result of different agencies, contractors and sub-contractors all seeking to further their own ends and the result at the expense of the big picture goal of workplace safety. Along with this was how the various parties would agree to risky plans, but in an arm’s length manner because to get too involved would have been to invite culpability. Also noted in the book was how things became much worse as a result of occurring late in an overdue project when everyone wanted it done. Additionally, the story was about hubris and the guy most in charge of worker safety coming up with an untested and dangerous plan and not listening to concerns from others. In terms of worker safety, Swidey notes that a poorly thought out safety measure can be worse than no measure at all as it provides the illusion of safety. Overall, it was a compelling read on extreme danger, modern engineering and institutional failures and Swidey did an excellent job covering all this while still having the book focused on and told through the stories of the men (and one worker in particular) at the center of the story. With this combining together really well story and character, the book reminded me of the Brendan Koerner book The Skies Belong to Us that I read and reviewed last summer. Back to Trapped Under the Sea... was an excellent book and also the subject of a short review by Chris Jones for Esquire.